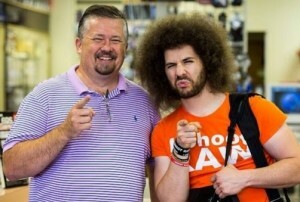 I ran into Jared Polin of FroKnowsPhoto.com at Allen's Camera in the Philadelphia area over the Summer when I was visiting the area. That's where this photo of the two of us was taken. I have not purchased the guide mainly because I started using my first flash over 30 years ago, but I am recommending that ANYONE not familiar with flash photography or needing to improve their skills get this guide purely on the reputation of Jared Polin. I come in contact with so many photographers in this digital age that DO NOT EVEN OWN a flash. Although that surprised me at first, it's now less shocking and is likely because of the digital age that so many people do not own a flash. I know a guy that shoots video with a Canon 5D Mark III and doesn't own a flash for still photography. He called me yesterday to get my advice on flash photography for something that he has coming up. I no doubt that this guide could make a difference to those not using flash. The other group of people are the ones that own a flash but either do not really know how to use it or just choose not to use it likely because they really don't know how to use it. These folks could also likely learn a thing or two about flash photographer with this guide. Using a flash, as you can see just in the promo video for the program, can take your photography to another level. There are so many things that you can do with flash photography that will make your images better when flash is used correctly. 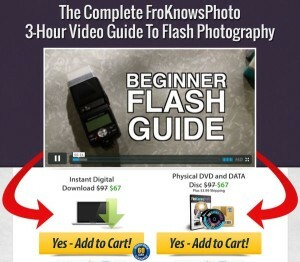 Be sure to at least watch the promo video and read about the program by going to this link: The Complete FroKnowsPhoto 3-Hour Video Guide To Flash Photography which again is NOT an affiliate link. Fro Knows Photo is on Facebook as well.